Our previous yearly visits to see Father Christmas hasn’t been the best, I mean not a poor performing Father Christmas, I’m referring to how Grace freaks out by him. 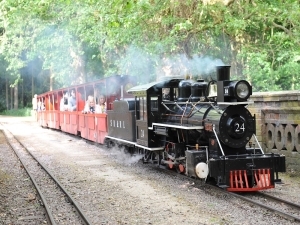 So this year after seeing many Instagram posts about this visitor’s attraction called Audley End Miniature Railway, we noticed on their website that they would be doing Christmas themed weekends where you ride the steam train into the forest and there you will meet the big man himself. Both myself and my wife have been following certain celebs on Instagram over the past year or so and seeing numerous posts about this miniature railway and we both agreed we must go there at Christmas. We booked our tickets online a few months ago, and slowly our big day got closer and closer. 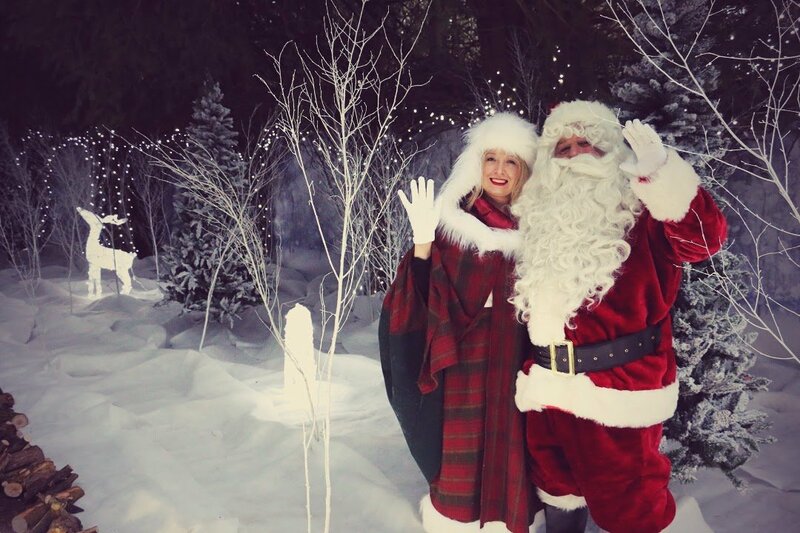 Tickets costs us £10.00 each, even for children its £10:00, babies from 0 – 12 months get in free and still travel on the magical train and receive a gift from the Big man himself. We set off on a very cold Saturday morning from London and after a thousand “are we nearly there yet?” we finally arrived, It took us just over 1.5 hours of driving, Thankfully the post code we used for our sat nav took us to the exact location. We arrived at the big wooden gates and was updated with what was happening during the day- a craft tent, a dancing tent, a small funfair (extra added cost to the admission ticket) the playground, a sit on model railway (extra added cost to the admission ticket) plus the gift shop. We took the usual pit stop (loo and nappy break) and then headed to the miniature sit on railway as our visit to Santa wasn’t until a few hours away. Myself and Grace had great fun riding on this mini train, twice around the field, we then headed to the dance tent and had a dance. Grace and mummy made some Christmas tree decorations in the craft tent. It was now time for lunch, we bought lunch at the Signal Box Café- burger n chips and a drink, can’t remember the price but it wasn’t too expensive. The food was your standard burger n chips, nothing fancy but it certainly wasn’t bad. Our bellies full it was time to cue up and get on that magical steam train to see Father Christmas in the forest. As we got onto the train, we were 1 of the lucky few carriages to have a nice warm blanket to keep us nice and toasty on our train ride. The fun now begun as 2 elves danced and entertained us, whilst father Christmas called the Station Phone and asked us to give a big HO HO HO! we were then sent on our merry way whilst the elves danced their way up and down the station platform and waved us goodbye. After many twists and turns, seeing different little figures all with their Christmas themed, going over a bridge, through 3 tunnels, about 15 minutes later we arrived in the Grotto, we were greeted by dancing and singing elves, whilst Father Christmas and Mrs Claus walked the length of the carriages saying hello and handing out presents to every child. The elves did another dance and then father Christmas wished us all a merry Christmas and waved us goodbye and we gravelled back to the train station. Grace never freaked out this time meeting Father Christmas, the smile on her face was beaming, her expression on her face I will never forget. We had a great Day and will definitely return again for another visit, Maybe the Gruffalo themed event. N.B. Our day out to Audley End Minatare Railway was a self-funded visit, I’m blogging and Vlogging about our trip because it was such an awesome family day out and more people should be aware of this place.